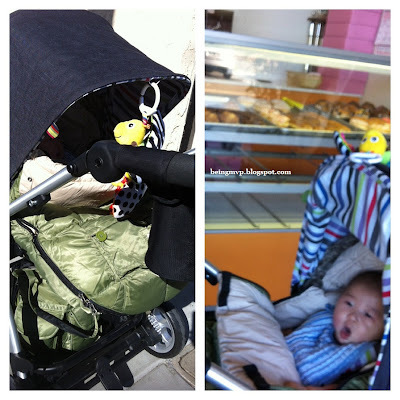 being MVP: 7 A.M. Enfant: Le Sac Igloo with Warmmuffs & Giveaway! 7 A.M. Enfant: Le Sac Igloo with Warmmuffs & Giveaway! Oh what a fickle weather system we have been experiencing here in Southern California. It varies from windy and chilly to sunny and sticky - all in one day. Since we moved to a neighborhood where I can walk to the pharmacy, restaurants and such (rather than going up and down a steep hill with no shopping at the end), I was excited to try the 7 A.M. Enfant Le Sac Igloo and Warmmuffs. Apart from being oh so chic and fashion forward, it is beyond functional. The Le Sac Igloo 500 is genius. We received size medium (3 sizes) which is for 6-18 months. It has so many features packed into one bundle. It was easy to place over the stroller seat as it has 5-point harness openings (easy to pull the straps through the velcro) and since the sun was peeking out in the morning I decided to detach the fleece blanket (simple snaps). The cotton lining is cush and fluffy for Mason to sit in. I unzipped the convertible hood because it was warm but it can easily be zipped when the winds pick up. The outer shell is water-repellent and breathable so perfect for harsh winds and rain. Perfect feature for random winds and rain that occur while one is out and about. This is also machine washable! The ability to simply zip on/off the sac is simply the best. Although the weather is in the high 70s this week, it will drop back to the 60s with rain by the weekend. Nights are still in the 40s-50s. You can even use this as a regular stroller blanket and even on infant carseats. I know many of the readers live in super cold climates and walk their children to school/bus stop so this would be an awesome cold weather baby accessory to have. If you have a new baby the sac goes all the way to the hood and cinches with the elasticized toggle for ultimate protection and warmth. I absolutely love the Warmmuffs and these are a must have for those who walk outside in the cold often. You can literally leave them attached to the stroller because they just velcro on. They are different from wearing gloves/mittens because you are actually still holding onto the stroller handlebar with your hands, just with a protective muff keeping your fingers warm! No loss of control here. 7 A.M. Enfant has all the necessities for keeping your babe cozy and safe from harsh weather including: baby carrier covers, Kenzie would love these Polar mittens, stroller foot muffs, kids winter hats, booties and more! Buy It: You can purchase the Le Sac Igloo 500 Medium Size for $135 and Warmmuffs for $38 . Make sure to connect with 7 A.M. Enfant on Facebook and Twitter! 7 A.M. Enfant Le Sac Igloo 500 and Warmmuffs! I would love to have the Pookie Poncho. Thanks for the chance to win! Infant hat and mittens. But I really love all their stuff! I like the new blanket! The Pookie Poncho looks nice! I'd like the Chapka Hat 212 . I think I accidentally entered an entry twice. Sorry. I'd love a pink Doudoune! I love this brand! I especially love the orange BagOcoat. I love the Booties 212. I love the Voyage Stroller Bag. I love the Roma Diaper Bag. I like the Barcelona Bag!! I would actually just love the Igloo! The Chapka Hat looks pretty awesome! I like the Chapka Hat 212! The Voyage stroller bag looks awesome. I must have it! The Pookie Poncho Classic looks like a good product. Love the roma diaper bag! I love the 212 evolution but need those warm muffs! I would also love the 7 A.M. Enfant Voyage Diaper Bag, Black/Gray, Large. Thanks!! I love the Barcelona bag. I like the Voyager Diaper Bag! i love the 7am voyage in neon green! I would love to have the Booties 500! I love the Booties 500! The Roma Diaper Bag looks very nice!